As soon as autumn arrives, this Creamy Pumpkin Soup with Leek is a family favorite. When you say pumpkin, I don’t automatically think of a savory pumpkin or squash soup. I think of harder to make sweet pumpkin desserts, like Pumpkin Pie or Pumpkin Roll. Growing up we would eat pieces of Sweet Roasted Pumpkin with butter and brown sugar as a dessert. I never considered pumpkin to be a savoury dish until I met my wife. 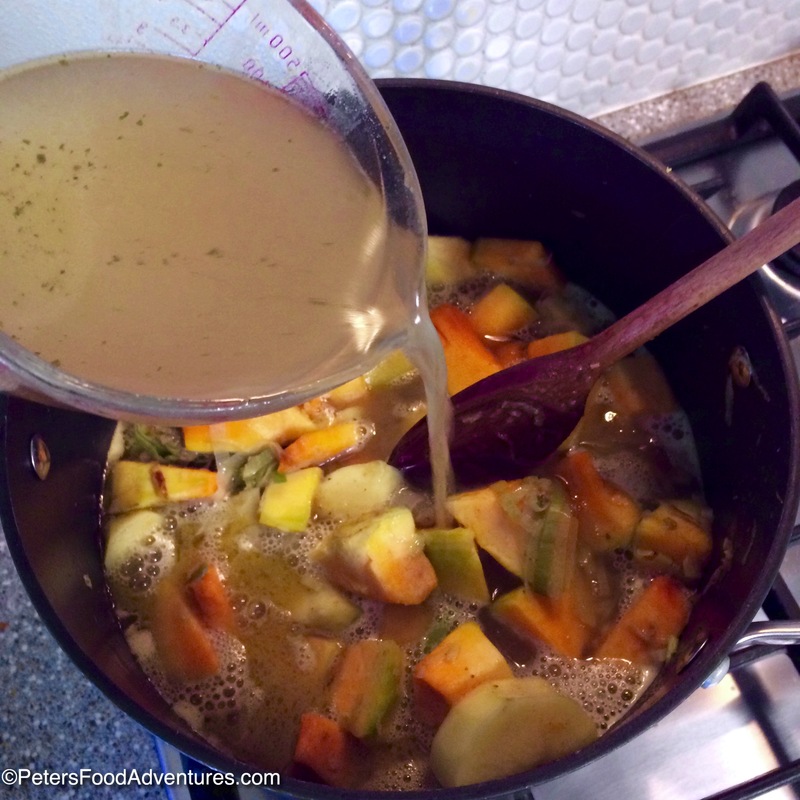 She made me the most amazing Creamy Pumpkin Soup with Leek recipe and I was completely hooked. I just love the smooth and silky pumpkin puree and leek with a hint of spices, in a delicious chicken stock. Moving to Australia, it seems that they view pumpkin as more of a savory dish, not a sweet dish. Pumpkin soup (an Aussie winter staple), savory pumpkin scones, savory pumpkin and vegetable pie, but not a sweet pumpkin pie in site anywhere! Australian Campbell’s Soup even makes canned pumpkin soup you buy in the grocery store. So now I get to enjoy the best of both pumpkin worlds, savory and sweet. Pumpkin soup is also quite popular in the USA, especially around Thanksgiving. My wife, Rita, has been experimenting with her pumpkin soup recipe for over 20 years, and this delicious and easy recipe is the result. The hardest part of making a creamy Pumpkin Soup is peeling the pumpkin. Be careful not to cut your fingers when slicing the skin away from the pumpkin. If you buy a 2kg pumpkin (about 4.5 pounds), by the time you peel and deseed it, you should have the right amount for this recipe. It’s quicker to use store-bought stock, however, it’s worth the flavour and time and nutrients to make chicken stock from scratch. Find my tasty chicken stock recipe here. Plan ahead and make the stock the night before. Like all my soup recipes, it’s a full stock pot, I’m not going to go through all this work and not have any leftovers! But if it’s too much Creamy Pumpkin Soup for you, feel free to half the recipe. Bon Appetit! Приятного аппетита! In a stockpot, sauté sliced leek in butter. Once opaque, add cumin and stir throughout. Add the diced pumpkin and diced potato and mix with the leeks. Add the soup stock and milk to the pumpkin mixture and bring to a boil, reduce heat to medium/low and simmer for about 20 minutes. Pumpkin and potatoes must be soft enough for a fork to easily pierce. Remove soup from the heat and add nutmeg. 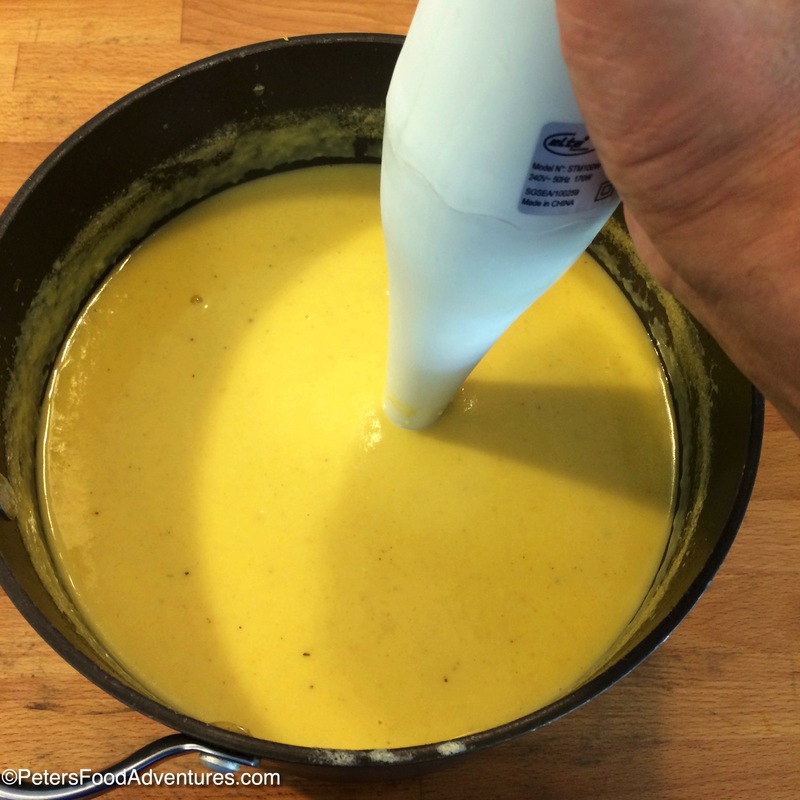 Using a stick blender/immersion blender, blend the soup mix until desired consistency is smooth without any lumps. Taste. Add salt and pepper to taste. Serve with a dollop of sour cream and a crusty loaf of bread. Looks delicious! I’ve never thought to add potato… great idea! That looks delicious, Peter! May have to add this to my repertoire! Thanks for sharing. I’ve been seeing more and more pumpkin recipes that aren’t sweets! This is fantastic. Thank you for sharing! Another great recipe to try out during the holiday season!